It's time to confess what seedlings we all still have that weren't quite timed properly or never made it to a "grown up pot". I know from posts in January that there are a lot of gardeners, including me, who do a lot with seeds. I can not be the only one who still has seedlings that haven't been planted in a container or flower bed at the end of June. First up, I have the violas. 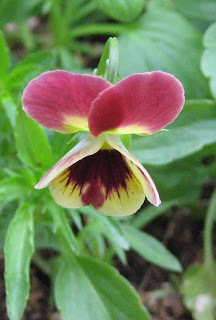 Usually, every other year or so, I get the big idea that I'm going to grow pansies and violas from seed, and sow them early enough that they are blooming and ready for containers by mid-March, in Zone 5, just like the ones that show up at that time in the big box stores and local greenhouses. So far, I've never gotten the timing quite right. My violas from seed are just now blooming and are still in the original flat I sowed them in. I think I'll pot these up now and see if I can keep them through the hot summer so they can be part of a fall planting. Then I can tell people that is what I planned to do all along. 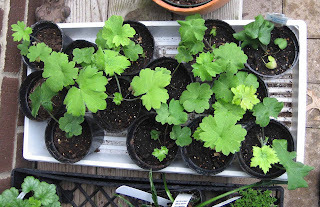 Then there are the Foerster's hybrid delphinium seedlings all potted up in three inch pots but not quite ready to be planted out with 'the big plants' in the wilds of the perennial bed where I intend to plant them. I left these inside under lights for far too long. I finally set them out a few days ago when it started to cool down a bit. Once I give them a little fertilizer, I think they'll be fine. My plan is to plant these out in early September, which will hopefully give them enough time to establish themselves before they go dormant. And by waiting until then, it will give me a few more months to prep the flower bed for them. Then next summer, will I have some delphiniums in bloom? I hope so! However, this is my first time to try Delphiniums from seed, so if anyone thinks that my plan is all wrong, let me know now, not when I post about about a tragic loss of Delphiniums in the spring! What seedlings do you still have? I think there are a lot of gardeners who always have some seedlings or cuttings or other experimental plants scattered about. I keep mine on the patio, where I can keep an eye on them. That's why my patio will never have that "finished" outdoor room look that you see in magazines pictures. 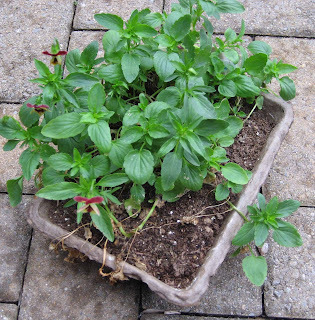 I'll always have a few little flats of plastic pots with something or other growing in them tucked in among the container plantings. In fact, I'm just a little bit suspicious of a gardener who has no seedlings or cuttings that they are still nurturing along in the middle of summer. Really, who gets absolutely everything planted in the spring? Hoh! This is too funny! And SO VERY close to home! I had some moon flowers and pink spiked cleosa sitting on my front porch for WEEKS until my friend and helper Lucia finally moved them to the garden where I would HAVE to plant them or watch them die! There is ALWAYS too much to do. And never enough time. Ha. I don't have any left over seedlings. This is because I didn't start any this year! However, someone gave me a couple of day lilies as passalongs, and they spent 2 months in the plastic shopping bags they arrived on the place in, getting occasional dousings with water. Amazingly, they lived! And now they are in the ground and one of them is even going to bloom. Probably one of the reasons I love day lilies so much, they are so forgiving. I like the violas, and when I plant them I always plant them as a fall flower. With some mulch, they frequently winter over quite nicely and start blooming VERY early int eh spring. I find them much more successful that way than planting them in the spring, where they seem to look great for a couple of weeks and then succumb to teh heat. Well, this post is enough to make me get back into seed starting next year. I confess I quit starting plants from seed because I felt so ashamed of the rootbound, half-starved plants still waiting in July for me to clear some ground to plant them in. Now I find out this is, if not normal, then at least not so unusual. 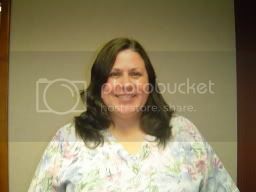 However, my laggards never looked as good as yours do. Anyone who grows their own seedlings is a true gardener. I try with a few herbs but I'm too impatient to wait for flowers. My straw hat's off to you. I have several flats of seed started flowers still waiting in the wings. Some are perennials, which I will pot up into larger pots to grow on a bit. I over planted petunias, so am just now getting them planted out in any empty spots in the vegetable garden and in containers. I have given away a ton of various plants. They are kind of like grandchildren....one friend called today just to tell me how well they're doing. :-) And I still have annuals (Cosmos, calendula, salvia, zinnia, etc.) hanging around to pop into empty spots when the perennials are done blooming. Next year I need to plant fewer seeds! Believe it or not, I just planted the rest of the zinnia seedlings yesterday! I have grown delphiniums from seed. I started them in July, put them in a holding be in September and they bloomed the following spring. I think your season is ahead of mine so you should be on schedule. If you have room in the garden beds, maybe the raised vegetable bed?, you might get stronger root growth by bedding them out now and then moving them in the fall or spring. They look good though. Oh, where, oh where do I START? Ummmmm. I just planted the tomato transplants I got three weeks ago YESTERDAY in the greenhouse. (Trying to ripen a tomato outdoors here is an exercise in futility due to the fog and cool temperatures, but in the greenhouse they at least get some heat on sunny days.) And as for the rest of my poor little seedlings; I moved them out of the house today into the greenhouse to harden up a bit before I put them outdoors and they should, in theory, get into the ground by this coming weekend. In my defence, I've been leery of frost at night still, though the last one was several weeks go. But we're almost to full moon so hopefully after that it will be assuredly safe. I just planted my peppers yesterday, and since I can't bear to throw anything out, I have 16 pepper plants in the garden. I don't know what I am going to do with them when they start producing. You are so right about left over seedlings. 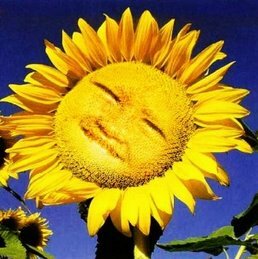 I have some sunflowers, lobelia, violas, marigolds. They were all started with the best of intentions but I always seem to find something growing at the nursery that I think would look better. Besides it feeds the 'instant gratification' factor. I don't know much about delphiniums except that I have heard they are hard to grow from seed, but I wish you luck. By the way, I love your site. I am in Utah, originally from Indianapolis and the same growing zone so I am always interested in seeing what you grow. I planted the rose campion starts this morning after losing about 80% of my healthy little starts due to neglect. I started my delphiniums a little late this spring and they are on my back deck waiting for something. I'll figure that our after I read these comments. That flower IS sticking its tongue out at you, Carol! Let's see, I finally planted the Verbena bonariensis that sat in their flat on the patio for so long they began to bloom. And, uh, I just bought a tomato plant today at the grocery store. Hmm, 70 days till fruit? We could have frost by then. Oh well...next year. I only bought a few violas this year because once it starts getting hot they die back fast. The johnny jump-ups however, reseed all over the place. They are everywhere but they are starting to die back. The only seedlings I have right now are pumpkin, watermelon and bird house gourds. What a timely post! I just planted the last of my seedlings over the weekend. Some of the cupheas were just a bit tall - er, maybe more than a bit - but I cut those back after I planted them. Most of the rest were winter-sown perennial wildflower-type things: eupatorium, ironweed, lobelia cardinalis. The reserve tomato plants (saved in case of casualties in the garden) are going to become compost. And I may try to plug a few holes with some direct-seeded zinnias or something, but other than that I'm finished planting for a while. This hits so close to home for me too! I keep mine on the back deck as well, so I can watch them closely. I have basil seedlings in 4" pots that desperately need to be transplanted, along with three tomato plants that are in larger pots, but also need to go their final resting places. See, I'm not the only one still messing around with seedlings. Thanks for the affirmation! Do seeds that haven't made it out of the packet yet count? I have lots of those! I couldn't BELIEVE that somebody else has seedlings waiting for a home! Thank you for that, now I feel much better!